A: I never predict the future! 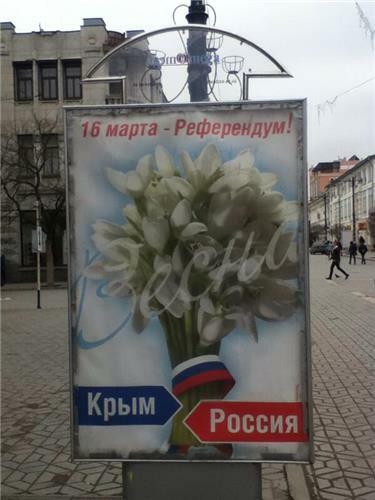 All I can say about this is that day by day, it feels the Russian noose in Crimea is tightening. More Russian soldiers are arriving, they control more areas/bases/buildings; pro-Russian activists and militias are getting larger and more aggressive, and they are now closing off the borders; the government in Kiev and its soldiers based in Crimea have displayed no willingness to fight back except through non-violent resistance -- which hasn't convinced any Russian or pro-Russian Crimean to reduce his or her presence. Q: Do you have any insight on the majority view of Ukraine concerning the uprising? Is it as region-specific as it appears on the news? A: It's very region-specific. In Crimea (where residents speak Russian), the majority look east toward Russia and they enjoy their legal and physical separation from the rest of Ukraine. Many of them want to either be independent or part of Russia. In eastern Ukraine (where residents speak Russian), which I visited before I came to Crimea, you find people who support Russia -- but often do not want to secede. These people associate more with Moscow than with Europe, but many argue separation could be economically catastrophic for certain areas. In Western Ukraine (where they speak Ukrainian), they feel more European, they connect more with European history, and they generally don't trust Putin or Moscow. Q: Hi Nick, thanks for doing this AMA. A: Interesting questions. I think you're right: Tymoshenko and Klitschko are the top two candidates and will be joined by 1-2 Ukrainian oligarchs who helped fund the Independence Square uprising. 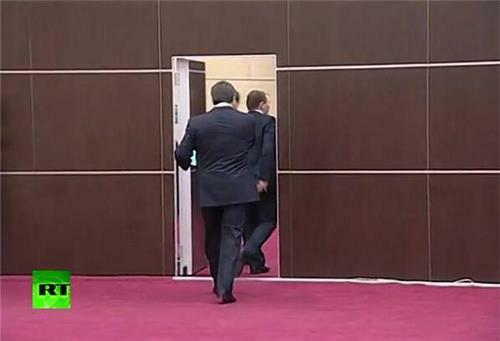 I don't think Yanukovych will be returning -- his former allies in Parliament have already abandoned him. To be honest, I'm not sure who will run in his stead. But you're right to suggest that the presidential election will have a big impact on the future of Ukraine. Bob Gates, the former US Secretary of Defense, said the other day Putin's end game is a pro-Russian government in Kiev. If he is going to succeed at that, he needs to influence the presidential elections and the parliamentary elections. And if that's the case, Crimea is a small prize for him. The big one for Putin is eastern Ukraine and figuring out a way to convince the government in Kiev to stay in the Russian orbit rather than taking money from the West and trying to join the EU. And that means he has to have influence over the Ukrainian president. Q: The Russians say that the Kiev government is illegal and has fascists in it and that Crimea was really Russia anyway before 1954. Sounds logical to me. The Ukranians say that Crimea can't secede legally and that Russia is indulging in a land grab and 'territorial integrity' matters. Sounds logical to me. A: Well, as always, both sides have points. Crimea was Russia until 1954. But it was given away by Khrushchev to Ukraine. That was just an administrative detail -- until the Soviet Union collapsed, and suddenly Crimea was part of an independent Ukraine. The majority of Crimeans never wanted that. And some are suggesting today that Putin is trying to undo what Khrushchev did. Is the Kiev government illegal? No. Former president Yanokovych fled, he was effectively impeached, and the legally elected parliament chose a new caretaker government. But did Yanokovych flee after being threatened, as Russia points out? Yes. Can Crimea secede legally? Well, I'm not a lawyer, but what the West says is that the current Crimean Prime Minister was elected by a parliament while pro-Russian troops pointed their weapons at lawmakers -- and that before the vote, the prime minister only had 4% support. Therefore, the referendum that the prime minister has moved very very quickly to hold is not legitimate, no matter what the vote is. 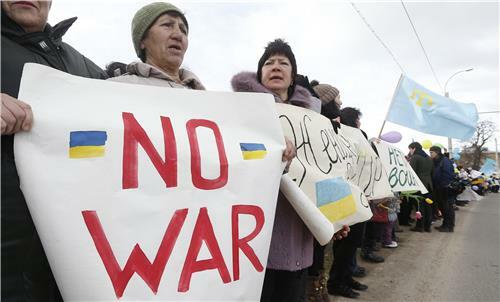 There are also concerns about intimidation that would limit the involvement of Crimeans who don't support Russia. As for the land grab/territorial integrity point -- there is no getting around the fact Crimea is part of Ukraine, and it is now being occupied by Russian troops. According to a statement, the Russian Foreign Ministry says the planned United States financial aid to Ukraine is illegal and goes beyond American legal framework, Reuters reports. @mfa_russia, the official Twitter account of the Russian Ministry of Foreign Affairs, did a bit of trolling with the international community Tuesday with a rather incendiary tweet. The Crimean parliament voted Tuesday to declare itself independent if voters approve the upcoming referendum to split from Ukraine and join Russia. However, much of the international community, including the United States, has called the referendum illegitimate. When asked during his Reddit 'Ask Me Anything' what pressure he feels from the Russian government to suppress information, Al Jazeera America's Nick Schifrin revealed it isn't actually the government threatening journalists but the pro-Russian activists. The pressure doesn't come from Russia -- it comes from pro-Russia activists and militants in Crimea. We have seen multiple threats on journalists here. At least two journalists have been kidnapped by pro-Russian activists. I interviewed another journalist who was beaten up by pro-Russian militia members outside a Ukrainian army base. The AP video team was held at gunpoint and their equipment stolen. And my team and I were held by an angry group of about 150 pro-Russian activists outside another Ukrainian army base. They slashed our tires, threatened to tip our van over and take our equipment until we agreed to show them our video from inside the base. After about 2.5 hours they let us leave -- but they escorted us to the equivalent of the county line. The reason for this intimidation is they believe journalists are anti-Russian and "spreading lies" about Russia's presence here. They argue we are all pro-Kiev and pro-Europe. They target journalists as part of an information war that you can also see on the airwaves in Crimea: pro-Kiev channels have been pulled off the air, and Russian TV (which the majority of Crimeans watch) is filled with messages in support of troops in Crimea and against the new government in Kiev. In his Reddit 'Ask Me Anything' Al Jazeera America's Nick Schifrin was asked what the people of Crimea actually want as a resolution to the crisis gripping the region. In my experience here over the last few weeks, the majority of Crimeans feel more Russian than Ukrainian. That means, in general, they support the Russian presence. Polls and demographic numbers suggest the split is about 60/40 in favor of people who lean Russian. That is for a few reasons: historic connection to the Soviet Union and Russia; large cultural and language differences between Ukrainians from Crimea and Ukrainians from Kiev and the western half of the country; feelings that the Kiev government has always disregarded the needs of people in Crimea. Many of those who support Russia are ethnic Russians; many of those who oppose Russia are Crimean Tatars. For the people who feel Russian, they believe the new government in Kiev is illegal and a product of either a coup or radicals' overthrowing the old government. Many of them watch Russian TV, which encourages the idea that protestors in Kiev have already arrived in Crimea (no evidence to suggest that's true). For the people who feel connected to Kiev, they feel more connected to Europe and don't trust Putin or Russia. 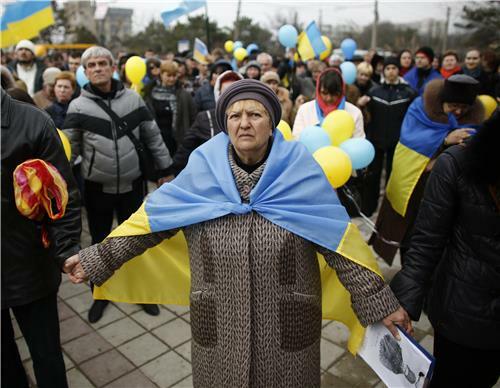 Noose in Crimea tightening. #Simferopol airport effectively closed. Only flights to, from Moscow. And all trains to Kiev "sold out." A continuation of the visit by unarmed personnel has been requested by Ukraine, this time to cover the south and east of the country. So far, 14 OSCE participating States have responded to the request, with numbers expected to rise over the next days. They are Belgium, Canada, Estonia, Finland, Hungary, Iceland, Ireland, Italy, Lithuania, the Netherlands, Slovakia, Spain, Turkey and the United States. The visit is taking place under Chapter III of the Vienna Document 2011, which allows for voluntary hosting of visits to dispel concerns about unusual military activities. It is expected to continue until Sunday March 16th. A first visit to Crimea was organised from 5 to 12 March 2014, when the group was unable to move beyond checkpoints at the administrative border. The Vienna Document 2011 is one of the main confidence-building measures developed by the OSCE. Under this document, all participating States are required to share information on their military forces, equipment and defence planning. The Document also provides for inspections and evaluation visits that can be conducted on the territory of any participating State that has armed forces. (18) In order to help to dispel concerns about military activities in the zone of application for CSBMs, participating States are encouraged to invite other participating States to take part in visits to areas on the territory of the host State in which there may be cause for such concerns. Such invitations will be without prejudice to any action taken under paragraphs (16) to (16.3). (18.1) States invited to participate in such visits will include those which are understood to have concerns. At the time invitations are issued, the host State will communicate to all other participating States its intention to conduct the visit, indicating the reasons for the visit, the area to be visited, the States invited and the general arrangements to be adopted. (18.2) Arrangements for such visits, including the number of the representatives from other participating States to be invited, will be at the discretion of the host State, which will bear the in-country costs. However, the host State should take appropriate account of the need to ensure the effectiveness of the visit, the maximum amount of openness and transparency and the safety and security of the invited representatives. It should also take account, as far as practicable, of the wishes of visiting representatives as regards the itinerary of the visit. The host State and the States which provide visiting personnel may circulate joint or individual comments on the visit to all other participating States. Polish Prime Minister Tusk says the European Union is set to impose sanctions on Russia starting Monday, Reuters reports. A NATO E-3A AWACS plane will fly over Romanian airspace as part of a planned exercise on Tuesday, Romania's defense ministry said. NATO had said AWACS (airborne early warning and control) planes will fly from their home airbases in Geilenkirchen, Germany, and Waddington in Britain. The Romanian ministry said AWACS planes fly at an altitude of 9,000 meters (5.6 miles), their radar can survey an area of up to 312,000 square kilometers and can detect low-flying targets. The NATO alliance said on Monday it will start reconnaissance flights over Poland and Romania to monitor the situation in neighboring Ukraine where Russian forces have taken control of Crimea. Ukraine is not a NATO member but Russia's intervention in Crimea has alarmed neighboring countries, including alliance members that used to be dominated by the Soviet Union. The Ukrainian parliament has warned the Crimean assembly it faces dissolution unless the March 16 referendum is called off by Wednesday, according to Reuters. Ukraine's Prime Minister Yatseniuk accused Russia of seeking to undermine the world security system, Reuters reported early Tuesday morning. 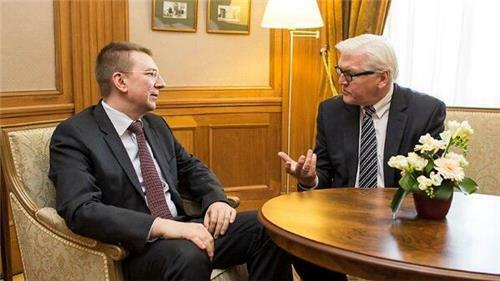 Also early Tuesday morning, German Foreign Minister Steinmeier said if Russia doesn't change its stance on Ukraine by the weekend, the European Union will discuss the next stage of measures against Russia on Monday, according to Reuters. During a radio interview, French Foreign Minister Fabius said the March 16 Crimea referendum is illegitimate and sanctions could be taken as early as this week, Reuters reported around 3 a.m. ET. Ousted leader Viktor Yanukovich said on Tuesday that Crimea is breaking away from Ukraine and blamed opponents who forced him from power for developments on the Black Sea peninsula, which is holding a referendum on Sunday on joining Russia. In a statement to journalists, Yanukovich also said U.S. financial aid to Ukraine would be illegal, saying that U.S. law does not allow the government to aid "bandits". "America and some other countries say I lost legitimacy as president because I fled the country. Let me repeat: I didn't flee anywhere." #Yanukovych again uses the #Bandera rhetorics. Speechwriters from #Moscow should have known he rarely used that word before he fled. 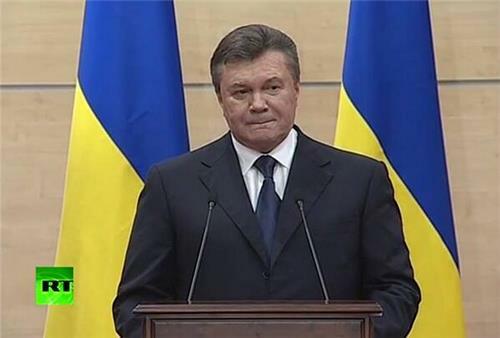 During a press conference on Tuesday, ousted Ukrainian President Yanukovich says the presidential election set for May 25 is absolutely illegitimate and illegal, according to Reuters. Yanukovich also reportedly said U.S. law prevents the United States from giving financial aid to illegitimate governments. Yanukovich said Crimea is breaking away from Ukraine, according to Reuters and blamed his opponents. US Ambassador to #Ukraine Geoffrey #Pyatt on #Crimea : There is no military solution to this crisis. It should be resolved diplomatically. Not good. Both sides now digging in heels. "Our fathers,grandfathers spilled their blood for this land. We won't budge a single centimeter"
Violence we saw today in #Sevastopol very savage - a terrifying moment that was a glimpse of the abyss #crimea hovers over. According to the Kremlin, 'despite differences' in assessing the situation in Ukraine, Russia's Putin and German Chancellor Merkel agree on the common interest in a de-escalation of tensions and a normalization of the situation in Ukraine as soon as possible, Reuters reported Sunday morning. According to Russian President Putin, Crimean authorities' actions are aimed at protecting the legitimate interests of the population of the peninsula, Reuters reports. Ukrainian Prime Minister Yatsenyuk has vowed not to give up 'a single centimeter' of Ukrainian territory, according to The Associated Press. As separatists in Crimea kept up pressure for unification with Moscow, Ukraine on Sunday solemnly commemorated the 200th anniversary of the birth of its greatest poet, with the prime minister vowing not to give up "a single centimeter" of Ukrainian territory. "This is our land," Arseniy Yatsenyuk told a crowd gathered at the Kiev statue to writer and nationalist Taras Shevchenko. "Our fathers and grandfathers have spilled their blood for this land. And we won't budge a single centimeter from Ukrainian land. Let Russia and its president know this." "We're one country, one family and we're here together with our kobzar (bard) Taras," said acting President Oleksandr Turchynov. A choir sang, and people laid bouquets at the monument to the son of peasant serfs who is considered the father of modern Ukrainian literature and is a national hero. Later Sunday, following an extraordinary meeting of the Ukrainian government, Yatsenyuk announced he would be flying this week to the United States for high-level talks on "resolution of the situation in Ukraine," the Interfax news agency reported.